This is a result of a question asked at the recent beginners day, I hope it helps you. Please feel free to send in your comments on 'Green Manure' and what works for you to share with our members. Manure is a term which commonly refers to animal faeces used as fertiliser and to add organic matter and nutrients to our soil. 'Green Manure' refers to a live crop which is specially grown to add organic matter and nutrients to our soil. The 'Green Manure Crop' plants may vary as to the reason you are planting them, the time of year and what you hope to get out of the crop. 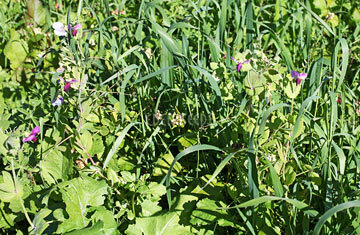 Most commonly 'Green Manure Crops' consist of a 'grass' and a 'legume'. The 'grass' for organic matter and nutrients and the 'legume' to add nitrogen and other nutrients. Cattle farmers would plant these under the name 'tropical pastures' with the dual purpose of feeding their cattle and improving the soil for future crops. Crop farmers would plant them between other crops to replenish the soil and to protect fields from erosion. They are usually grown for a certain period of time after which they are cut and dug into the soil. In order for most legumes to 'fix' nitrogen in the soil they need to be coated with an inoculant, which is a Rhizobia, (a naturally occurring soil bacteria). It will cause nodules to form on the roots which will supply nutrients to the soil. Different rhizobium suit different legumes, the correct one will be supplied with seeds when purchased. To apply the inoculant either moisten seed with a little milk then coat with inoculant or mix a little powdered milk and water with the inoculant then coat. Once you have grown an inoculated crop, the type of rhizobium that you have added to your soil will help other legumes that need the same rhizobium to fix nitrogen properly. To plant your 'Green Manure Crop' select the seeds you wish to use, (you will need a lot more seeds than you would normally plant) mix them together and scatter them fairly densely and evenly over the area to be covered, then cover them with a thin layer of compost or rake them into the soil. Allow them to grow for at least 6 - 8 weeks, if you want to leave them for longer that is okay. If growing them for flowers to attract beneficial insects leave them until no longer required. It is usual to cut/slash the 'Green Manure Crop' then it can be either left on top of the soil as a mulch to break down or dug into the garden bed and left for 4 - 6 weeks before being turned over and used for planting. Sometimes it may be necessary to plant a 'Green Manure Crop' to suit a special purpose. One such special purpose could be if you are having a problem with root nematodes. If this is the case plant a mustard seed, marigolds and nasturtium 'Green Manure Crop'. My personal 'Green Manure Crop' mixture is made up with all the unwanted and/or out of date seeds (flowers, herbs, vegetables) from my seed storage crisper tray in my hubby's beer fridge to which I add mustard seeds from the kitchen cupboard, maybe some other lentil or pulse seeds from the kitchen, then some legume and grain seeds, whatever I have or can get easily. It is surprising how well they all grow even those that are out of date. I let it grow for as long as possible, cut it once or twice then dig it in. It all helps. A 'Green Manure Crop' is good to plant in your garden if you are going on a long holiday, by the time you return it will be ready to dig in, your garden will appreciate the extra organic matter and produce even better crops for you. 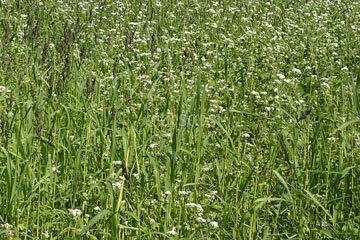 You will find a large range of seed for sowing green manure crops online at Eden Seeds.